Joe and I love Spanish Rice. It doesn't matter if it's homemade or Rice-a-Roni, we really enjoy it. Just now I realized that I never shared my usual Spanish Rice recipe. Well, we liked this one so much, it might be a while before I make our old favorite! Last week, I found this recipe for Spanish Rice Bake on the Betty Crocker website. It looked easy and the ingredients are so basic that I had them all on hand. Aside from taste, that's the top factor in deciding if a recipe is a keeper or not! The recipe calls for Condensed Tomato Soup. I wasn't sure how I was going to like that. I use Condensed Tomato Soup in my Beef Stew, but the soup flavor changes once it's combined with the London Broil and veggies. In this case, I wondered how it would be without the meat helping to flavor the soup. But I followed the recipe, only making a few adjustments: I added celery, a tad bit more oil, left out the cilantro and used less cheese. The result? We loved it! I originally planned to serve this with some quesadillas during the week. But I didn't get around to it until the weekend. We picked up some BBQ Chicken at a community event on Saturday and this rice dish was the perfect side dish! Cook rice, onion, celery and peppers in hot oil until rice is golden and veggies are tender. Stir often. Add corn. Cook a minute longer. In a bowl, combine the soup, boiling water, chili powder and salt. Pour into casserole dish. Stir in 3/4 cup cheese. Sprinkle the remaining 3/4 cup of cheese over the top. Bake uncovered for another few minutes, until cheese is melted. You can add the first half of the cheese when combining all of the ingredients in the casserole dish before putting it in the oven (like the original recipe). My laptop battery died and I was following the recipe by memory at that point! I'm not a huge fan of cheese, I liked the cheese that was melted throughout the casserole, but I could have skipped the cheese on top. Next time, I'll only sprinkle cheese on the top of half of the casserole. Also, the next time I make this, I'll be adding a cup of black beans to bulk it up a bit and making it a complete (meatless) meal! Adding some pre-cooked diced chicken in the last 30 minutes of cooking would also be a great option for bulking up this recipe. The rice looks awesome! I love rice like this, thanks! That sounds really good. I have a spanish rice recipe that I throw in frozen mixed veggies and it looks alot like this one. YUM! Would love to have you link up to Tip Day Thursday some time! Popping over from Tuesdays at the Table. This looks like a great side dish! Can't wait to try! Thanks for visiting! Yes, I'm on the weight loss journey. I've struggled with my weight off and on over the past 20 years. Pretty much since I had my gall bladder taken out at 16. I've lost 24 lbs since January using sparkpeople.com. I LOVE it and it's FREE :) Looking forward to getting to know you better. This looks fantastic. My daughter loves rice. Cannot wait to try this recipe. Looks so good, so cheesy and flavorful, we'd love it. 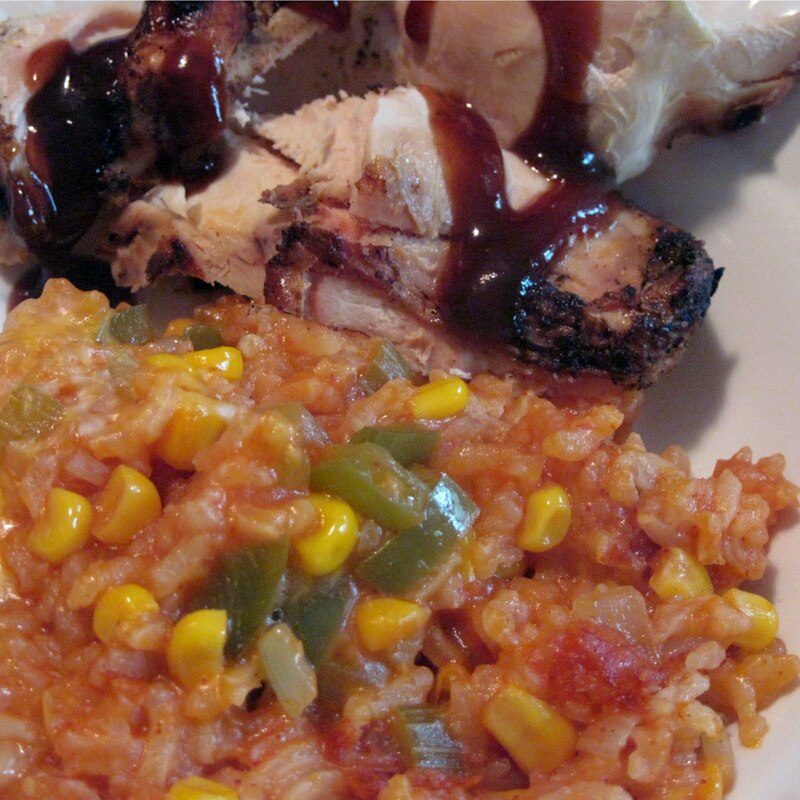 Hi, I liked the recipe of Spanish rice, it is so different. I have never tried this kind of recipe and shall give it a try for sure. Your Cheesey Spanish Rice Bake look delicious. We would just love this as a side or a main dish to go with our Tex Mex Dinners. This recipe has great flavor. Thanks for sharing with Full Plate Thursday and come back soon! Sounds like a delicious spanish rice recipe! What a perfect side dish to make for any meal! Thanks for sharing your recipe. We'll have to try it!